In January, 1942, the Argentina Maru sailed away from Guam, taking with it prisoners of war, including American military and civilian personnel, Navy nurses, American and Spanish priests. All unaware that they would remain in concentration camps in Japan until the end of the war in 1945. This was a harsh reminder to the Chamorros that the island was truly in enemy hands, and ushered in the second occupation of Guam. Many Chamorros were forced from their homes and loved ones, some never to return. In March, 1942, three months after the Japanese invasion and initial occupation of Guam, the island came under the control of the Imperial Japanese Navy. The keibitai, the newly installed military government, controlled Omiya Jima, meaning Great Shrine Island, for nearly one and one-half years. Commander Hayashi Horace, who initially led naval landing troops during the December Japanese invasion, headquartered the keibitai at the former Governor's Palace in Agana. A detachment of troops was also stationed at the former U.S. Marine Barracks in Sumay. 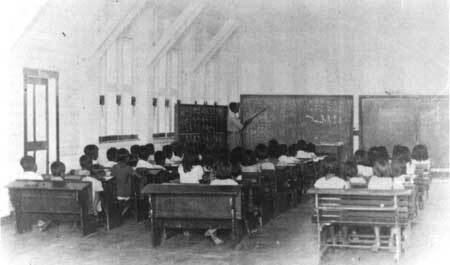 Chamorro students are instructed in the Japanese language during the occupation of Guam. The troops of the keibitai were kept under very strict control by their officers. During weekend liberties, sailors would don their white uniforms and stroll through Agana. The sailors would sometimes visit the homes of those Chamorros who chose to remain in the city, bringing gifts of candy, as well as much appreciated Japanese Kinsei and Sakura cigarettes. Chamorros would, in turn, give the Japanese cooked food, fresh fruit, and handicrafts. However, this was not to say that all was well. The Japanese were often ruthless in their search for six American Navy men who chose to hide out in the jungles, rather than surrender. The day-to-day administration of island affairs was under the control of the minseibu, whose offices were located at the St. Vincent de Paul building, adjacent to the Dulce Nombre de Maria Cathedral in Agana. The cathedral was used as a public auditorium for various activities, greatly offending the predominantly Catholic Chamorros. To care for the people's spiritual needs, the Japanese allowed two Catholic priests, Father Jesus Baza Duenas and Father Oscar Calvo, as well as the Baptist minister Reverend Joaquin Sablan to remain on island. Beloved and respected by the community, Father Duenas openly voiced his concerns for the protection of the people and often refused to make announcements for the Japanese, unless it was for scheduled meetings and regulations. Troops of the Imperial Japanese Navy muster in front of the former U.S. Marine Corps barracks in Sumay. Assisting the minseibu as interpreters and investigators during this period were Chamorros from Saipan, Tinian, and Rota. (These islands, along with other Northern Mariana Islands, were seized by Japanese forces during World War I. The takings were subsequently approved by the League of Nations.) This greatly disturbed Guam's Chamorros as these men, their brothers, later proved to be just as cruel, if not more so, as the Japanese soldiers themselves. Lieutenant Commander Homura, an elderly Japanese officer, served as the governor of the island. Homura's glowing accounts of Japanese victories during the first months of the war, angered many Chamorros who could not imagine the defeat of such a powerful country such as America. As Homura governed Guam, George Tweed, a U.S. Navy radioman and the sole American not captured during the Japanese occupation, was hidden from the Japanese by many courageous Chamorros, including Father Duenas, as well as the Cruz, Limtiaco, Tanaka, Castro, Pangelinan, and Artero families. Japanese ordered former local policemen to remain at their posts. Former veteran police officer Adolfo Sgambelluri worked closely with Joaquin Limtiaco, a local businessman, who was forced to look for American fugitives and hidden radio receivers. Sgambelluri informed Limtiaco of planned Japanese searches for the Americans which enabled Limtiaco to remain a step ahead of search parties. Tweed moved from one location to another eventually settling in the northern jungles of the island. Chamorros suspected of assisting the American were dealt harshly by the Japanese. Limtiaco was one to suffer severely for his heroic acts in aiding Tweed. He not only protected and hid Tweed but, like many others, assisted the American by providing essential electronic parts to rebuild a radio. A network of secret radio receivers was in operation throughout the island by the Chamorros, who would listen to American broadcasts on the progress of the war. The news was then typed by Tweed on his old, battered typewriter and distributed island-wide. Another method of passing secret war information was through soap bars. A prominent citizen and pre-war high school teacher, Agueda Iglesias Johnston, was allowed to make soap. She would often put news messages into the small bars and would then sell them to customers, often under the watchful eyes of Japanese troops. As schools were re-opened in April, adults and children were required to learn the Japanese language and culture, as the Japanese were intent on re-enforcing the Nippon Seishen or spirit of Japan. In early 1942, Chamorro laborers were recruited to build the first defenses, including the construction of the Orote airstrip. Some laborers were given a handful of rice as the only compensation for their strenuous work. The Chamorro's faith in the American flag grew stronger just as life became harsher under Japanese occupation. The phrase, "Tiuapman! Na'ianimo," or It won't be long; take courage, became a common greeting among the people. Many Chamorros believed the Americans would return; it was only a matter of time. Lt. 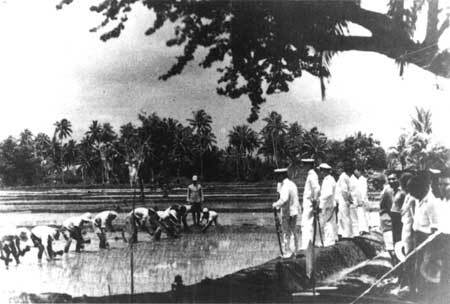 Commander Homura, governor of Japanese-occupied Guam, and his military aides, watch over Chamorro laborers in an Inarajan rice field. Chamorros were forced to endure harsh keibitai rules and regulations, including changing the name of Guam to Omiya Jima, the Great Shrine Island.